Technical Director Ken Langhorn announces the addition of new mixing and blending equipment at the Ross Test & Development Center located at the company's headquarters in Long Island, NY. The new additions include a 1-cu.ft. Ribbon/Paddle Blender and a 2-gallon Planetary Dual Disperser, both rated for vacuum operation, equipped with a jacketed vessel for heating/cooling, capable of variable speed and automated discharge. A 5-cu.ft. Tumble Blender with mirror finish V-cone vessel and integrated controls is also now available for mixing trials. The Ross Test & Development Center offers demonstration and testing services to help customers identify the best possible equipment for their particular application, generate data for scale-up or solve a mixing problem. 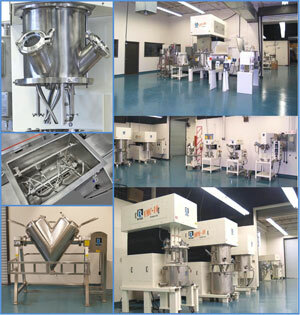 The facility houses over 30 mixing, blending and dispersion equipment of various sizes including High Shear Mixers, Ultra-High Shear Mixers, Powder Injection Systems, Multi-Shaft Mixers, Double Planetary Mixers, Planetary Dispersers, Vertical Blenders and a Three Roll Mill. Auxiliary equipment such as heaters, chillers, spray bars, vacuum pumps, condensers, discharge systems, diaphragm, centrifugal and positive displacement pumps are also available. It has its own analytical laboratory equipped with a particle size analyzer, viscometers, moisture analyzers, microscopes, sieves, pycnometers, pH meters, grind gauges and other instruments. A wide range of non-hazardous applications can be safely handled at this testing facility. Utilizing the end user's actual raw materials, the process-line simulations performed here are essential in confirming the most appropriate mixing strategy prior to making a purchase commitment. Factory Acceptance Tests (FAT's) are also done here for customers who choose this service for their new Ross mixers.